Today saw the launch of Apple Pay in the UK, allowing millions of iPhone and Apple Watch users to leave their wallets at home and make contactless purchases using their devices. This move has the potential to revolutionise the way we pay for things, but perhaps more relevant to the world of branding, it is indicative of an accelerating shift in the way consumers engage with the retail environment. British owners of the iPhone 6, iPhone 6 Plus and Apple Watch will be able to pay for items in over 250,000 stores across the UK and the entire Transport for London network, simply by holding their phones to contactless payment terminals and verifying the payment with their fingerprint. Apple’s launch is due to be swiftly followed by rival apps for Android, meaning vast swathes of the British population will soon have little need for cash or credit as they hit the shops. On the surface this technology would appear to have little impact on the retail experience for most shoppers, with the tapping of a card simply replaced by the tapping of a phone. However, what it does mean is that the smartphone will more than ever play a central role for consumers while in-store. A recent study from Google suggested that over 80% of consumers already use their mobile phone while shopping, with the largest group suggesting they use theirs to compare prices and products with alternative stores. With the introduction of Apple Pay, the use of smartphones during the retail experience will only increase, and yet many retailers and brands are failing to spot the advantages of using mobile content in-store. A number of technologies are already readily available to brands and retailers, allowing direct engagement with consumers on a mass scale. Beacon technology is becoming cheaper and more widespread, allowing retailers to beam up-to-date information and offers to shoppers’ smartphones that is directly tailored to their individual preferences. The personalised connection that this allows means that retail brands are able to connect with consumers through mobile in ways that simply aren’t possible with traditional point-of-sale material. Meanwhile, smart tags and point-of-sale can contain augmented reality and QR codes, allowing consumers to explore branded content beyond the physical items they are shopping for. 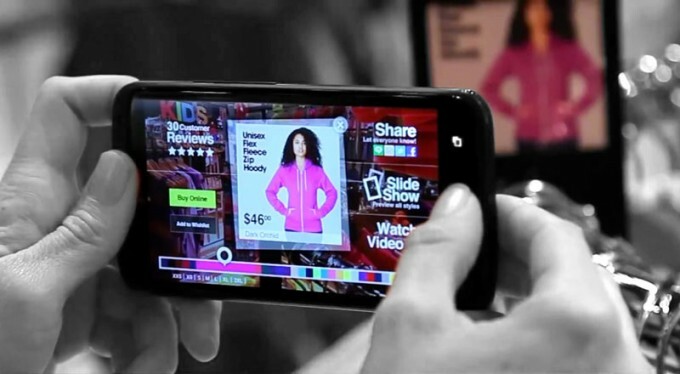 American Apparel recently took advantage of this technology with the launch of an app that allowed shoppers to view the alternative colours and styles available for an item, simply by training their smartphone camera on the item. Calls to action to share and review through this app then extended the interaction beyond the shop floor. Directly engaging with shoppers through apps and social media while they are in-store can help build a relationship between the brand and the shopper that is more than simply transactional. Building this non-transactional relationship is crucial if a brand is to continue to relate to and engage with consumers after the moment of purchase. Retailers are becoming increasingly aware that pricing and products form only a small part of their brand positioning. The entire shopping experience is crucial in order to generate brand equity and loyalty in an overcrowded market, and reaching out to consumers through innovative mobile technology is a brilliant way of achieving this. Many retailers and brands have already taken notice of the advantages of engaging with consumers through mobile content. However, with the arrival of Apple Pay and its competitors, in-store mobile content is likely to move from gimmick to necessity. Brands often engage with consumers in interesting ways before and after purchase, but engagement during the retail experience has an equally large capacity to make a connection. The arrival of Apple Pay will only serve to accelerate the growth of this trend by leading consumers to rely on their smartphones while in-store.